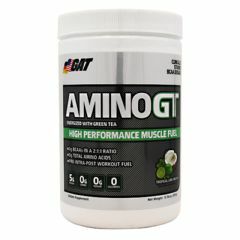 AllegroMedical.com presents The GAT Amino GT - Tropical Lime Mojito Amino Acid Supplement. Energized with Green Tea. High performance muscle fuel. 5g BCAAs in a 2:1:1 ratio. 8g total amino acids. Pre-intra-post workout fuel. Amino GT high performance amino acids plus energy! Amino GT contains 8 grams of amino acids to support muscle growth and repair. Athletes who exercise strenuously require additional amino acids for energy, muscle building and recovery. Amino GT also includes 5 grams of BCAAs, the dosage that has been clinically shown to reduce muscle soreness and assist with recovery. Supports muscle growth and repair. The 2:1:1 ration of Leucine to Isoleucine and Valine is the most scientifically studied for athletic performance. Shown to be effective in numerous studies to promote protein synthesis and encourage a positive protein balance in the muscles when you need it most. The 2:1:1 ratio has also been shown to reduce muscle damage and accelerate recovery from resistance training. Product highlights: Contains 8 gram Amino Acids with BCAAs in a 2:1:1 ratio, the most scientifically supported ratio for sports performance and recovery. Delivers 5 grams BCAAs which was clinically studied to be effective in faster recovery of muscle strength than the placebo group. Energized with 100 mg of natural caffeine from Green Tea. Citric acid, pineapple fruit powder, natural and artificial flavors, maltodextrin, acesulfame potassium, silicon dioxide, sucralose, FD&C red #40 (dye), FD&C blue #1 (dye).